Disclosure: This post is sponsored by Kwik Stix. All opinions are 100% my own. See our disclosure policy for more details. Just a few more days until December and when we start our annual 25 Days of Christmas, which is intentional time we spend together as a family doing Christmas activities to countdown to Christmas. These activities can vary from going to see Christmas lights or see a Christmas play to something as simple as reading Christmas books by the fire or doing Christmas crafts. My girls always love to do crafts, so we tend to do several Christmas craft nights as our family nights. I am always on the hunt for ideas of crafts which they can create with their own personal style & creativity, but also have them similar enough as a finished product that we can display them together in a group and it’s even better if it’s something we can bring out year after year as part of our Christmas decorations. We recently tried this craft idea for my daughter’s Mermaid birthday party (see the pictures of how their mermaid paintings turned out on Instagram) and it was such a hit, that I wanted to do a Christmas spin on it to have some pretty Christmas paintings to display around our home that our girls have made. With the busy Christmas season, I want to keep crafts contained & as mess-free as possible, so this is where Kwik Stix comes in! 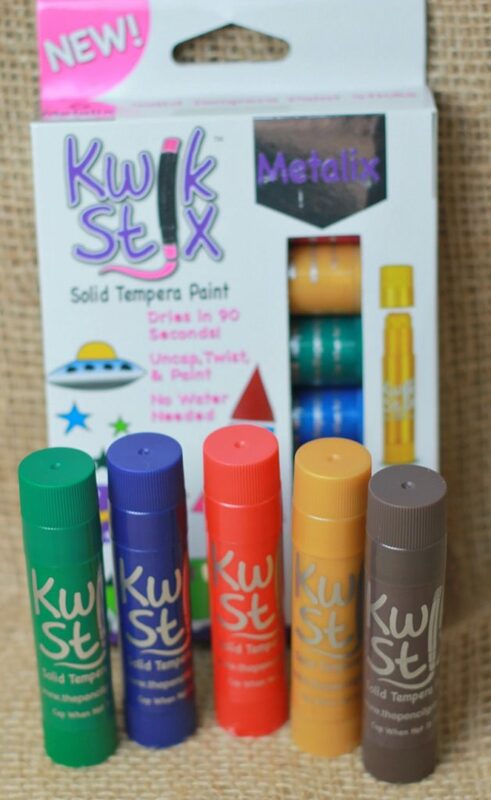 We have been using Kwik Stix mess-free paints for over a year now and honestly, it’s our favorite art supply! The fact that it is virtually mess-free AND it is so portable to bring anywhere, makes it a big win in my book! Plus, the Kwik Stix paint dries in 90 seconds and that’s a huge plus when you are doing arts & crafts with your kids and their friends! 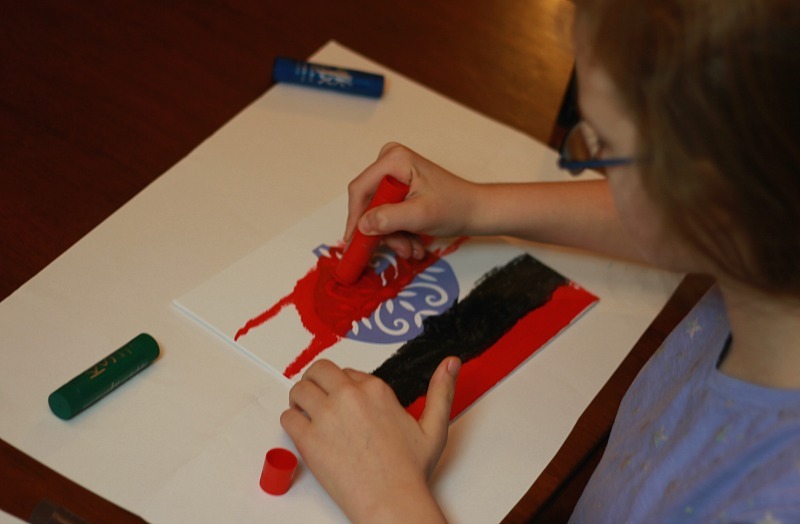 This craft can be a fast craft for kids – it really depends on how detailed their get with their painting as far as how long it will take, but it’s something that all kids can do & have a beautiful, finished painting as the result. 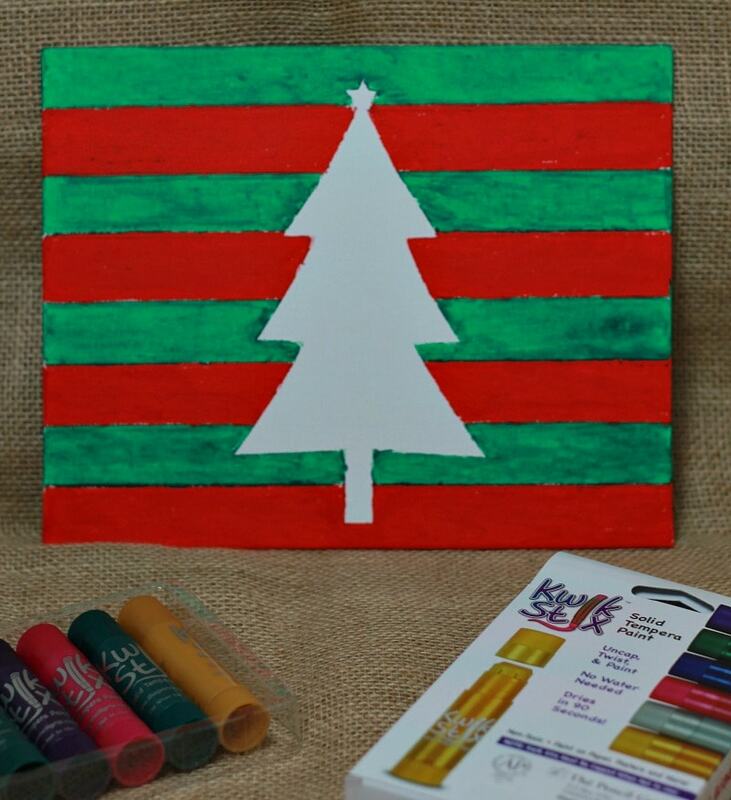 A great opportunity to show off their creativity with the background colors & if they choose to do any designs with the background, but then still having a bold, Christmas image to show off. 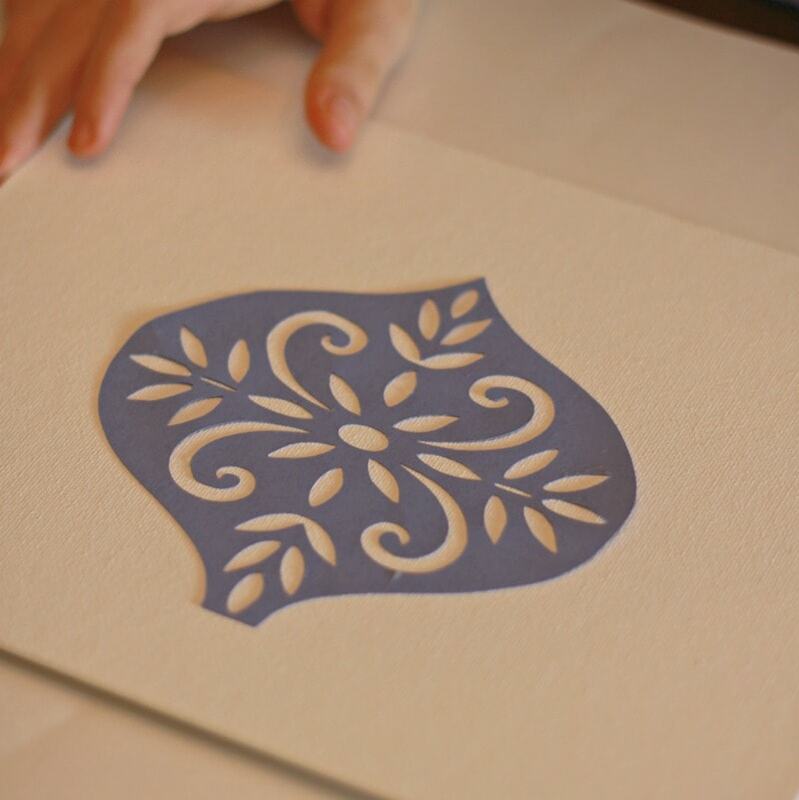 Die cut or shape cut out of cardstock for your silhouette image – you can either draw and cut out an image yourself or print one off the internet (see lots of options here) & trace it onto cardstock. I used my Cricut cutting system to cut out a few shapes quickly. Canvas panels or stretched canvas – you can really use any surface you want to create these paintings – I just think it looks so nice & finished with the canvas boards. I used this pack from Amazon, but you can also find these at Michaels & use a coupon for the multi-pack. Glue the image (images) to your canvas – we used a glue stick to stick this to the canvas lightly. You can use any adhesive you want as you will be taking this off after your paint is dry, but you want it secure enough that it won’t wiggle as you are painting over the image. Paint the canvas any color and design you want – this will be your background. Paint all around the image so that it’s completely covered around the image as this will create the silhouette effect (you don’t want any white showing around the image as it won’t show the lines of the image). We used Kwik Stix paint sticks, which was perfect for this project as it dries in 90 seconds, which was important so that we could peel off our image fairly quickly. Once your paint is fully dry, peel off the image carefully. 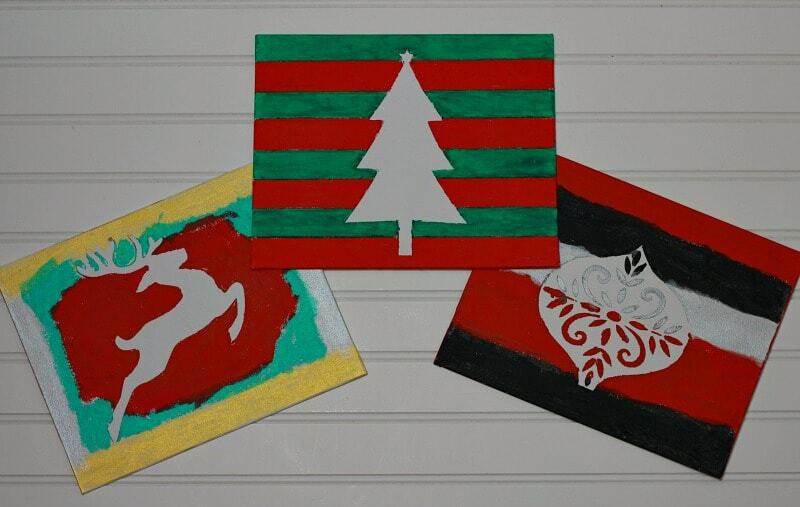 You now have a beautiful painted canvas with a pretty Christmas silhouette design. It’s really that simple! Another twist on this is to do the opposite & paint your canvas first with a solid or design for the background. 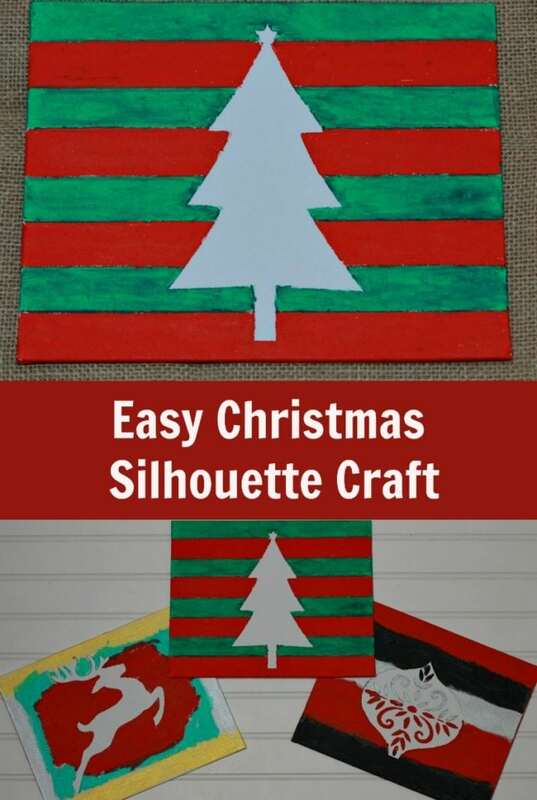 Then, you can cut out your image on black or white cardstock and glue the Christmas image to the painted background for a different effect. This is better if you have really intricate designs that may not work as well to be painted over to show off all the detail. I like the silhouette effect for those simple, bold images to make more of a statement & really pop. It’s fun to see how creative your kids can get, too, and see their own personal spin they put on the painting. As you can see, my younger daughter used her own creative design as the background for her painting, so it’s very unique to her personality – I love it! We have been using Kwik Stix paint sticks for over a year now and honestly it’s one of my top favorite art supplies because it works so well for great coverage for any painting or coloring craft we do, but it’s virtually mess-free! This is what every mom wants to hear, right?! You don’t have to drag out the big plastic tablecloth, water cups, and all those paints every time your child wants to paint. We just keep the Kwik Stix in a basket downstairs so our kids have easy access to it, as all we require is that they use a piece of paper underneath to keep it clean. 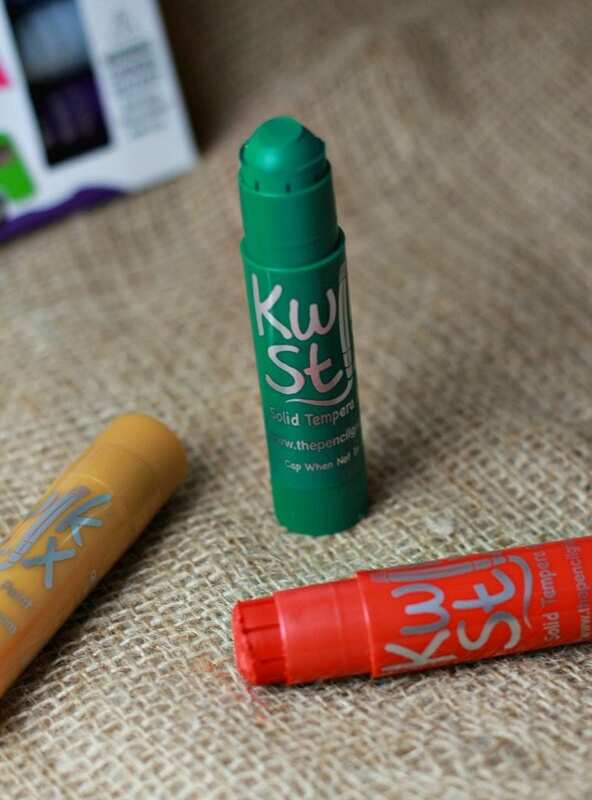 Kwik Stix paint sticks are solid tempura paints that are AP certified and non-toxic so you can feel comfortable your kids and their friends using the paints. If you have kiddos with allergies, Kwik Stix are not only egg, peanut and gluten free, but they are also dairy free and soy free, as well, so that’s reassuring that it’s safe for so many kinds of allergies. Plus, that 90 second dry time makes it the perfect craft for craft get-togethers with friends and parties where you’re doing an art activity. They are also so easy to transport & bring with you to the park or a friend or grandma’s house. Kwik Stix are now available so many different locations, which makes them easy to find. The new locations where you can now find Kwik Stix mess-free paints are in store at Michaels and Walgreens stores this fall. BJ’s only has the 24pk of Thin Stix available for $19.99 (normally priced at $24.99). And Michael’s has the 12 pack of Kwik Stix, plus the Neon and Metallix 6 packs of Kwik Stix. The Pencil Grip, the company that makes Kwik Stix, now has a new product, which just came out last month. 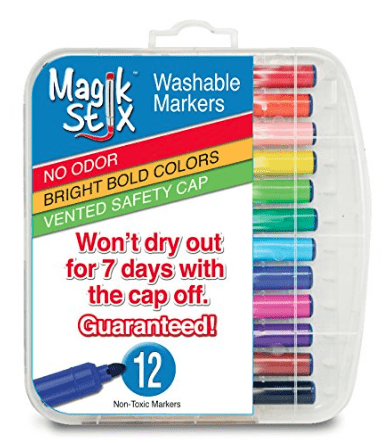 These are the Magic Stix Washable Markers, which are guaranteed to not dry out for 7 days with the cap off. They come in bright, classic colors and are non-toxic as well, so you can feel good about using them with your kids. Plus, you don’t have to worry if kids forget to get those caps back on. They can be found on Amazon.com. We’d love to hear the different ways you have used your Kwik Stix and any creative ideas for Christmas craft activities to make with them! 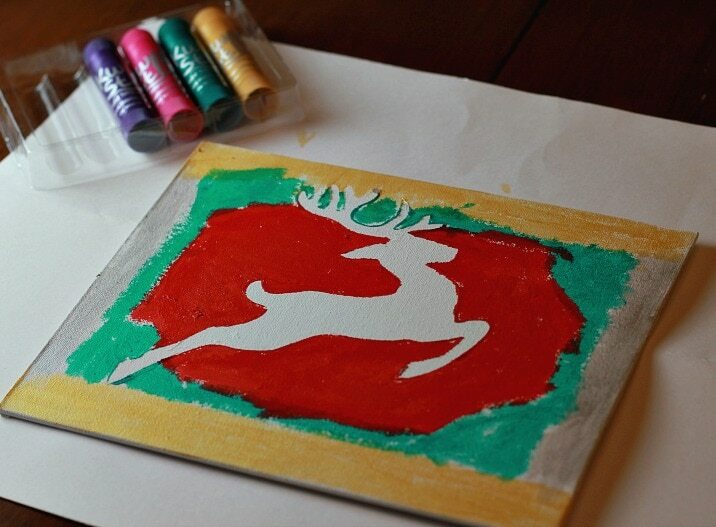 These DIY cards are such a fun holiday activity to do with family + they’re really cute! I’ve never used stick paints before but I’ll keep them in mind in my next arts and crafts project! What a great idea! I’m going to have to look into these for my nieces!